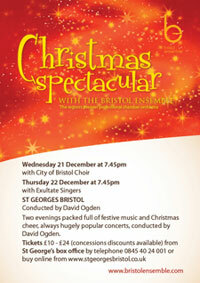 A stunning evening of Christmas celebration given by City of Bristol Choir in collaboration with professional orchestra The Bristol Ensemble. Come and enjoy a festive-themed extravaganza of warmth, passion and bonhomie with audience carols and Christmas music for choir and orchestra. A uniquely moving mixture of revelry and reverence.